I got this set down as I was in a coloring mood one evening. I first did the potted hydrangeas combined with the decorative paper I found in my stash. I love the colors in this one -- my kind of earthy hues. The Stampin' Up Scallop edge punch was combined wtih the two Scallop Square punches that I arranged on opposite corners of the flower image. On the second card, I first stamped and colored (using Copics on both) the flower and then stamped over it with the "blos*som" stamp also in the set. The Gratitude decorative paper has been in my stash just waiting for the right application. I really like the way these turned out. Hope you like them, too. These are great too!!! 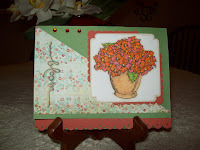 I love the raised centers and the stamp OVER the flower!! !